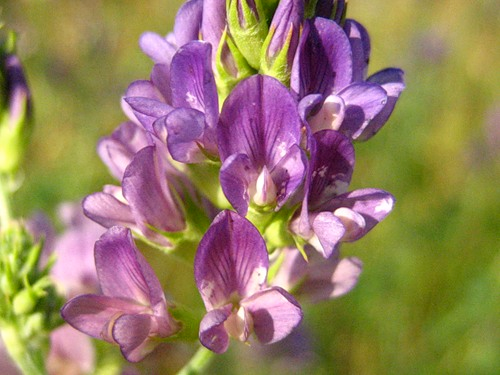 The pascual alfalfa (88) sort of the variable alfalfa (Medicago varia) was developed by the scientists of the Russian National Feed Stuff Research Institute named after v. R.Williams in order to plant it in non-black soils. This sort possesses a good nitrogen-fixing capacity, it is stable to poaching damage, it grows well after grazing, there’s almost no damage made by root rots. It also possesses a good competitive advantage in case it is cultivated in grass mixtures. The bush is semi-erected or erected. The plant height reaches 120-140cm. The bushiness is moderate — 37–46 stems per each bush. The stem is moderately rough, it is lightly dropped and it has green joints. The leaves are diamond-shaped, moderately soft, they don’t have vegetable wax. The color is dark-green. Pascual alfalfa (88) during the first year.